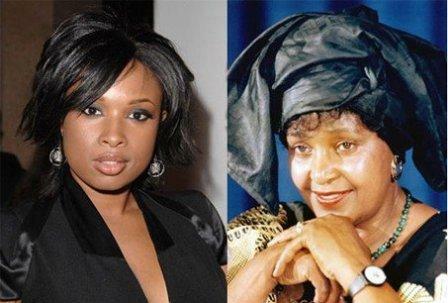 When I first read, a week or so ago, that singer/actress Jennifer Hudson had been cast to play Winnie Mandela in a biopic, I wondered: will they show her laughing and being entertained while her henchmen “necklaced” innocent fellow South Africans? For those who don’t know, “necklacing” is the process of setting a gasoline drenched tire around a person’s neck and setting it afire–a very torturous way to murder, often practiced by the former Mrs. Mandela as she engaged in assorted barbaric terrorism against fellow Black South Africans as a way to “fight the oppression of apartheid” and institute her own far more oppressive methods. Yup, the woman, Winnie Mandela, is a murderer and a terrorist, not to mention a crook who used the money of anti-apartheid forces to spend on herself. Given all this, I have to laugh at South Africans who are now upset that Ms. Hudson, who is American, has been cast to play this cretinous terrorist, instead of casting a South African actress. It would be a little like America protesting that a Norwegian or Swede had been cast to play Jeffrey Dahmer. “He’s our serial murderer cannibal . . . and–damn it!–it’s a matter of American pride that a Yankee play him.” Say what you want about America and Americans, but at least we wouldn’t be that stupid. So glad that the “post-Apartheid” South Africans have their priorities and sense of national pride straight. Aw c’mon, they need the money! One look at where Zimbabwe is today should tell you where South Africa will be in a decade or two. Oh come on, any actress would see this as the role of a lifetime. Besides, Mrs Mandela is far more complex a character than Ms Schlussel seems to realise, including her stint as the former wife of Nelson Mandela and her reign as the ‘Mother of the Nation’. But if Jennifer Hudson is going to play Winnie, for heaven’s sake spare us the fake African accent – just let her speak American, it’s okay, really. Yes, Winnie was so wonderful that Nelson divorced her shortly after being released from prison. She was a murderous adulteress even in his eyes. Winnie Mandela was not a complex person, but merely someone who took advantage of her husband’s fame for self-enrichment and to obtain personal power. The fake African accent may be what makes the movie worthwhile. If the film is going to be a travesty, let it go all the way, by all means. Why are they upset at that but not that Morgan Freeman is playing Nelson Mandela??!? It shouldn’t surprise me that this blog is pro-apartheid. So, Winnie gets a free pass on assasinations and embezzlement just because she was married to Nelson Mandela? Even Nelson Mandela dumped her due to those activities. President Mandela is apparently a far more decent and sensible person than you are. Take your race baiting somewhere else. When the article puts the phrase “oppression of apartheid” in little scare quotes, it’s quite telling. Ok, time to put you all on the spot. Should South Africa have dismantled its apartheid system in the 1990’s? I’m upset but for other reasons. Jennifer Hudson is far too beautiful to play Winnie Mandella. Why in the hell do they always use gorgeous actresses to portray the Plain Janes? Also, when you look at Jennifer Hudson, what do you think? Why is Hollywood so afraid to cast a Plain Jane to portray another plain Jane? Never could understand the fetish the left had with the Mandella’. Nelson if I recall was jailed for setting off a bomb in a mall that killed a women and her baby. And now will be exposed to obnoxious interviews where Jennifer Hudson will tell us gushingly how much it means to her to play the role of this great person. What’s next, a movie of Al Sharpton? [Nelson if I recall was jailed for setting off a bomb in a mall that killed a women and her baby. I’ve never heard or read such a thing even on the internet. South Africa, how do the libs like it now? Dear Mr. Blitzer & Ms. Nel: You’re both right, and thanks. Dear Mr. Coltrane: You find me one pro-apartheid sentence on this blog. Just for the record, where is it documented that Winnie Mandela ACTUALLY TOOK PART in the necklacing? I know she knew it was going on. Winnie at many times publicly praised the use of “necklacing”. Whether she actually lit the match or not is not important. She was telling her followers to kill innocent people. Nelson Mandela is an inspiration to all terrorists. Because he is a terrorist, a murdering blood thirsty terrorist. But he won the war and got to be praised by the entire world. Other terrorist look to him and figure if they can win, then they will receive praise and power also. I asked you guys a direct question. For as much as right wingers blather on about “right and wrong” and “moral absolutes”, it’s amazing to see how quickly they run from direct questions. Don’t be a coward, answer the question. Around 1990, in NYC the corner of Second Avenue and E42d Street hung a commemorative ‘Nelson and Winnie Mandela Corner’ street sign. This is right down the block from the U.N., and at the time Winnie was deified; this was before the world heard about her necklacing prowess, cruelties, thievery, and infidelity. Jennifer Hudson might do her career better to avoid portraying a scumbag in schlock. I think enough is enough. Enough damages have been done to this woman and her reputation. Those people can treat Mrs Mandela as the only murderer, adulteress, divorced, drunkard… in the world. She is the only sinful woman. All the rest are righteous, pure, saints. Those who make movies and articles on her are all just and righteous men and women. What happened to this woman can happen to anybody. Does she beg food from them? Does she beg or borrow clotes or shelter from them. Christ will come soon. Let us concentrate our energies on our own life by seeking the kingdom of God and his righteousness. Each of us will be accountable before God on our faith and deeds. Please, let us wait and see if Mrs. Mandela is the only sinner in South Africa and in the whole world. Let us don’t forget that those who have pleasure to broadcast sins of others will be severely judged. Mum Winnie Mandela, we are poor sinners. May the Almighty God who is above all the gods of this earth, has never dinied you, who is all the time with u, continue guiding you, feeling u with His Holy Spirit, faith in Christ, courage, strength to face this other form of adversity. Pray for your ennemies who don’t want to see you happy. Inspite of all the the tribulations, they couldn’t reach their aims. So they have conceived another strategies. But I know, you are more than conquerous. Your maker is with u. We are also 100% with you. Your God in whom you belief is called “The Living God”. Mum Winnie, Deborah and Tabitha of our time, may God richly bless you.